In the past few weeks I’ve been trying to catch up with all the reading that I haven’t been doing in the past few months. 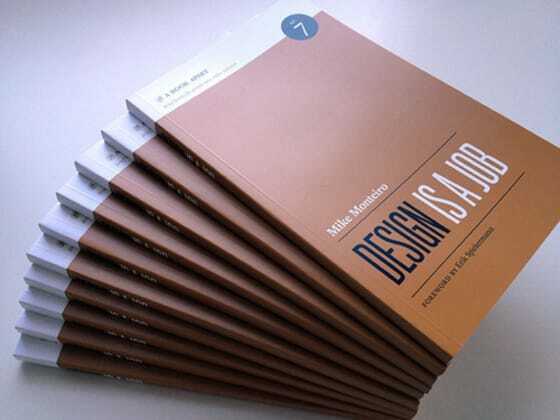 One of the books in my to-read pile that I was particularly eager to read was Mike Monteiro’s “Design Is a Job”, published by A Book Apart. I was not disappointed. Mike writes about what he has learned throughout his career, running his own design studio, and giving precious insight on subjects such as giving feedback, client interaction, getting paid, and working with other people. I think this is a book of particular relevance to any designer as it explains in a very clear and concise way why and how we should stand up for ourselves, stop blaming everyone else around us for the things that are our responsibility and, in the process, do better work. At the risk of copying and pasting the entire book into this post, I’ll stop now and let you find out more for yourself.